The Attorney Case File, a case management system vendor, is offering a new free ebook that working paralegals and paralegal students may find helpful, Trial Notebook. You can download this online resource at no charge at http://www.theattorneycasefile.com. 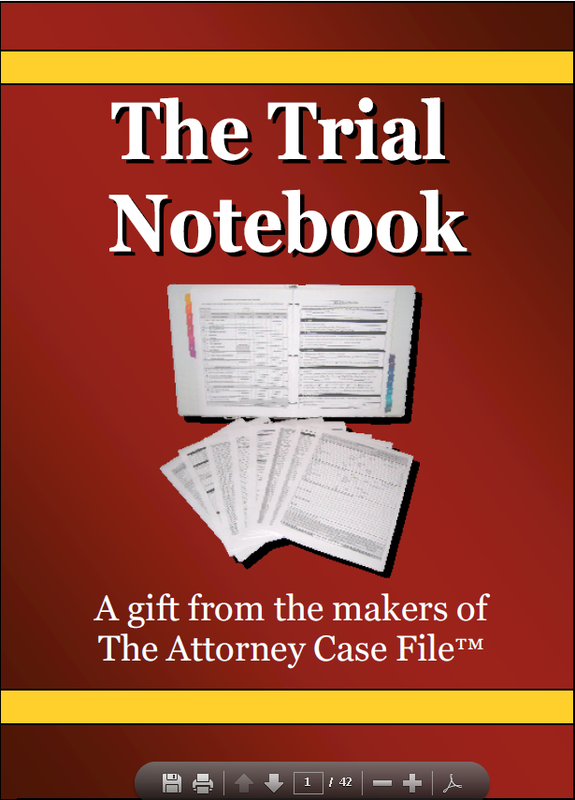 While every legal professional has personal preferences for his or her trial notebook, this free ebook provides an excellent overview of how one is used during trial, as well as some detailed forms. I especially like the Day of Court Checklist, which includes a section for the trial team’s courtroom technology, including power cords and batteries. Note: This is not a paid advertisement. As ya’ll may notice, Practical Paralegalism has no sponsors, and refuses to turn on those banner ads for online paralegal programs that I don’t know anything about. Any products, software, and/or apps I blog about or share in CLE presentations are because I like them or have heard good things about them from other legal professionals.